Where does Tiger's 2019 Masters rank among his 15 major victories? Tiger Woods won the lion’s share of his 15 majors before the internet grew into what it is today: An unrelenting content churn that feeds and thrives on giving both immediate perspective and succumbing to recency bias. Was Tiger’s 2019 Masters win his greatest major victory? Was it the best sports moment we’ve seen in our lifetimes? I saw both questions being asked on my social media channels while his final putt was still rattling in the cup. And it made sense. As the world’s preeminent athlete of the 21st century, Tiger is nothing if not an #internetcontentmachine. Like Marvel movies or Simpsons characters, he’s produced enough individually great chapters that ranking each makes for an easy bucket of click chum to throw overboard. In my eyes, there’s a clear Mount Rushmore of Tiger’s major victories and while you could make an argument for any of the four to be No. 1, there’s also a clear order. 4. 2008 U.S. Open at Torrey Pines: It says something that Woods’ “Michael Jordan flu game” — which lasted not just 48 minutes but 90 holes and five days — still comes up a flop wedge short against the three wins in front of it. That Tiger was able to win the toughest test in golf on a both a broken leg and torn ACL is something that’s otherworldly and would rank No. 1 for almost all other golfers. The injuries required immediate surgery after he outlasted Rocco Mediate in an 18-hole playoff on Monday. 3. 2019 Masters: This is the spot we’re seeing most other sites places Sunday’s victory, but let’s talk about the characteristics you could use to build an argument for being No. 1 (and, really, I’m open to it). • The top 10 featured five other major winners, most of whom were still flipping Pokemon cards when Tiger won his first green jacket in 1997. Runnerup Brooks Koepka won three of the previous seven majors, making him the strongest No. 2 finisher in any of Woods’ major victories. 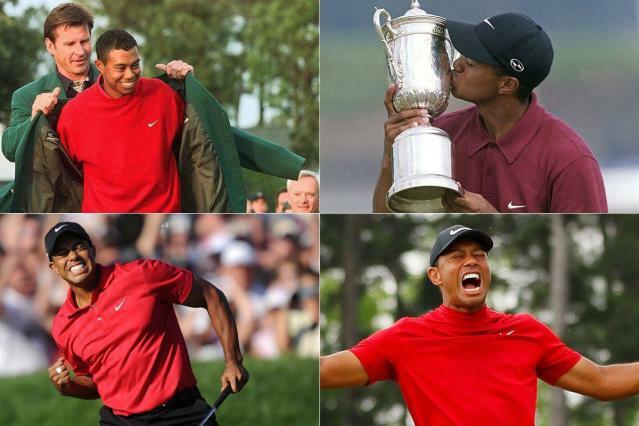 • As you’ve heard mentioned a few times, it was the first time Tiger has ever come from behind to win a major. • In terms of providing drama, this one can’t be topped by any of the others. The 2019 Masters was the climactic ending to an 11-year fall from grace that we all watched intently because we couldn’t be sure how it would end. When the coda came laced with heavy themes of redemption, aging and family, it was even better than many of us could have written. As for the reasons it doesn’t sit atop the list? • It wasn’t a dominant victory. When most of your reputation has been built on dominating major victories, it doesn’t make sense to have No. 1 a middle-of-the-pack win when it comes to margin of victory. • The next two entries on the list were that good and the No. 1 brought along just as much narrative and overall impact. 2. 2000 US Open at Pebble Beach: Look, when you’re ranking Rolling Stones albums, there are a lot of ways to get cute and show how much smarter you are then every other rock critic. But you still better have Exile on Main Street up near the top. The 2000 US Open was Tiger’s “Exile” — a 15-shot victory that was over by sundown on Friday and remains the biggest blowout win in major history. The tournament kicked off the “Tiger Slam,” which would end with his second green jacket at the 2001 Masters. 1. 1997 Masters: Draw up a list of the greatest sports moments of the 20th century: Jackie Robinson breaking the color barrier, the Miracle on Ice, Ali vs Frazier … Woods breaking through as a 21-year-old man of color in a tournament that didn’t feature a black player until 1975 stands equally among any of them. In addition to the societal implications, Tiger’s 12-shot victory while setting the tournament scoring record proved a seismic change in so many other areas from forever changing the PGA Tour to sports marketing to forcing Augusta National to “Tigerproof” its course. While no one who watched Tiger’s 2019 victory will ever forget it, there was nothing like watching young Tiger showing up that weekend in 1997 and showing the world that nothing in sports would ever be the same.